Sophie Green has been announced as Worcestershire's 2019 Young Poet Laureate. Worcestershire's Young Poet for 2019 has been announced, following a performance event at The Hive on Sunday (20 January). 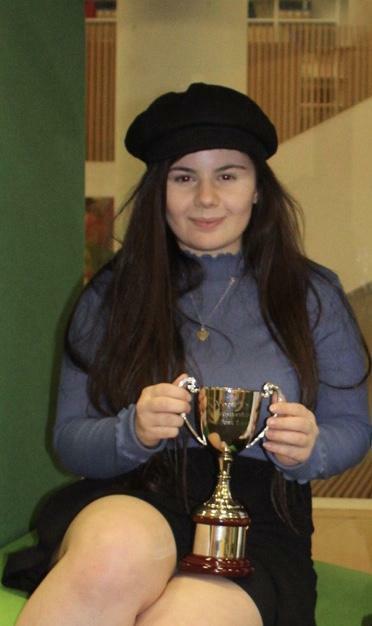 After a close competition, Sophie Green, 18, from Redditch and a psychology student at University of Worcester, took the 2019 title with her poems 'THERE IS NO FILTHY TO THIS' and 'MANCHESTER'. The judges included outgoing Young Poet Laureate, Connor Evans, who was alongside previous Birmingham Poet Laureate (2017-2018) Matt Windle and Carol Brown, Service Manager, Libraries and Culture. This is not the first time Sophie has entered Word Up! She has been a finalist before (2017) and a runner up last year (2018). Sophie Green, winner of the Worcestershire Young Poet Laureate for 2019, said: "I'm incredibly stunned that I won this competition, given how amazingly talented the entire group was. There were so many people that deserved to win and honestly, I'm just still in amazement. "I'm so excited to start work on this title I've been given and hopefully, I make people proud by the end of it, especially the wonderful people I competed with and those that set up the event." The certificates were handed out by Laura Worsfold and the winner and runners-up were announced by Councillor Hodgson, who also awarded the winner's trophy. Councillor Lucy Hodgson added: "This has been one of the most closely contested competitions we have ever had and it was a pleasure to be there at the final. The young people of Worcestershire, entrants and finalists should be really proud of their efforts in this year's competition. We have seen Sophie perform previously and it is a delight to see her now take the winning title." Worcestershire's Young Poet Laureate competition is run by Worcestershire County Council's Libraries & Learning Service in partnership with Severn Arts. It is an annual poetry competition for young people, designed to encourage young people to express themselves through poetry and to support the development of young poetry talent across the county. Laura Worsfold, Chief Executive of Severn Arts added: "We are delighted to be promoting poetry and supporting the Word Up! competition. The quality of the poetry and young people's performances were outstanding. We are really looking forward to seeing and hearing more poetry in the County. Well done Sophie." This year's competition required poets to submit two poems, one on the subject of 'Change' and another on a subject of their choice. During their year Worcestershire's Young Poet Laureate is asked to write and perform five commissions to a variety of audiences as well as being an advocate for poetry, particularly for young people. Performance coaching is available to all finalists and additional mentoring is available to the winner.